The Causeway Community Finance Fund is one of the social enterprises operating under Causeway. Causeway is a community economic development agency that runs employment programs and social businesses to help people with barriers to employment find jobs. This is the first part in a two-part series that highlights our work on the Causeway Community Finance Fund. In this series, we reflect on our key learnings, challenge some of our assumptions, and look to re-imagine a financial system that can work for everyone, specifically those vulnerable residents in our communities who feel there are no other options but to resort to a payday lender. The Causeway Community Finance Fund (CCFF) has been operational as a small pilot for over one year with support from our three credit union partners, Alterna Savings, Frontline Credit Union, and Your Credit Union. 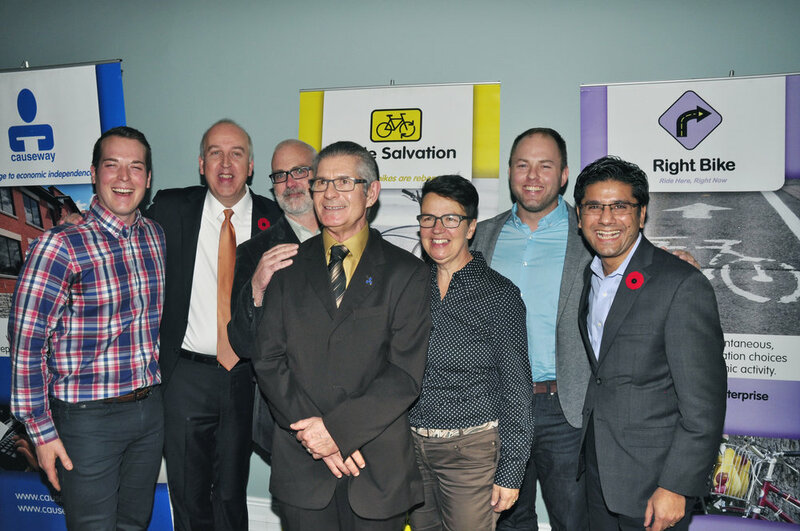 Since the launch of the CCFF, we met with a growing number of people, and media outlets who have leapt at the opportunity to learn more about a better and more responsible alternative to payday lending – the first program of its kind in Ontario. The creation of the CCFF, despite its limited resources, has struck a nerve in the city — confronting the problem of the payday lending industry and fostering conversations around creating solutions. Why Start a Community Finance Fund? The Causeway Community Finance Fund (CCFF) was designed to support financially vulnerable individuals who find themselves trapped in the high cost cycle of interest and fees attached to payday lenders. 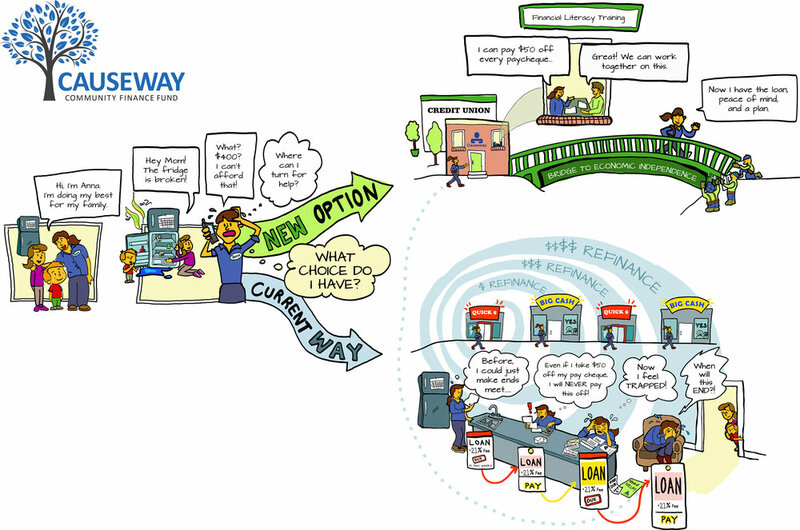 Recognizing that this cycle was a real issue for a significant number of our clients, Causeway created the Causeway Community Finance Fund (CCFF) which was designed to be a better alternative to payday lenders by offering fair loans at a reasonable rate. Individuals who come to the CCFF — many of whom with multiple payday loans — are given a consultation to find the best way to pay off their high interest loans. After an initial consultation, we connect our clients – many of whom have little or no access to quality mainstream banking and financial services – to one of three local credit unions that have provided operational and financial support to Causeway: Alterna Savings, Frontline Credit Union and Your Credit Union. Why do so many people take out loans from payday lenders in the first place if it is so risky? Many Canadians who live from one pay cheque to the next turn to payday lenders to cover budget shortfalls due to income insecurity, unplanned life expenses, and the inability to access small-dollar credit options through traditional banking services. The reality for a lot of these borrowers is that they simply have no other choice. By accessing even one payday loan to cover a budget shortfall, they risk falling into a spiraling cycle of high-cost debt – a cycle that is extremely difficult to break out of. Payday lenders offer short-term loans of up to $1,500 and according to the Canadian Consumer Financial Association (formerly the Payday Lenders’ Association of Canada), the average loan is $435 with a 10-day repayment period. The cost of a $100 loan, regulated by the provincial government’s Payday Lending Act, is $15 minimum. To put this into perspective, the cost to a borrower for a 10-day $300 loan is $45 – an annual interest rate of 400%! Limited access to mainstream financial services is only one of the reasons why CCFF clients are more vulnerable to predatory lending services. One of the central challenges affecting our clients daily is the lack of income. Widening income inequality poses a significant threat to our most vulnerable residents who often rely on meagre social assistance and disability payments to survive. Many of our clients even forgo food to re-pay their payday loans. Income inequality has been increasing steadily in Canada over the past 25 years. Figure 2 illustrates the widening of the income gap for those in the top 20% versus the stagnating middle 60% and bottom 20% of income earners. What makes the widening income gap troublesome is that the net worth of the lowest earning Canadians is decreasing. Those who are in the lowest income quintile actually maintain a negative net worth (see Figure 3). The decrease in net worth for the bottom 40% of Canadians means that many are not accruing the financial assets required to participate fully in economic and social life. The fact that low-income earners have negative net worth is a crisis situation for an income group that relies on virtually all their income to cover their basic needs. This phenomenon is playing out before us in the experiences of those who come to Causeway to access a loan. People who lack enough income to get through the month often resort to payday lenders to cover budget shortfalls due to the inadequate amount of affordable housing in Ottawa, the rising cost of food, and the limited social and disability assistance provided. Since our launch we’ve met with well over 100 individuals, most of them living in deep poverty. The average net monthly income for our borrowers is $1,591, placing them below the Low-Income Cut Off measures. Many of our borrowers use fringe financial lenders for basic financial services. With average monthly expenses of $1,440, there’s little to no margin for error for our borrowers. It’s easy to see why low-income residents are especially vulnerable to payday lending. With minimal savings and limited credit options available to them, they fall victim to an exploitive practice that is almost impossible to break free from. Bank branches have been closing in many low-income areas around Canada as retail banking has changed its business model. This change prioritizes investors over customers. In some cases, there are even policies in place that prevents people living on social assistance to access a loan. Taken together, these gaps require system-wide coordination between policy-makers, financial institutions and civil society. Our experiences at Causeway have demonstrated there are gaps in the retail banking sector that can be overcome when we apply entrepreneurial approaches. Many Canadians, especially low-income individuals relying on high-cost credit options, a new pattern of financial exclusion is emerging. In our next post we explore the changing nature of financial exclusion and why developing a new model for community banking is imperative. Figure 3: Net Worth for Canadian Households by Income Quintile. Source: Statistics Canada (2017d). Table 2005-0003 - Survey of Financial Security.